On 6 July 2016, the Chilcot Inquiry was published bringing the ‘Iraq War’ to prominence again. The long awaited twelve volume, 2.6 million word report, which took seven years to compile, critically reflects upon the controversial decision taken by the UK government to go to war in Iraq. It is the latest in a long series of texts to examine the political and humanitarian consequences of a conflict that changed Iraq’s social, as well as geographical, landscape. When Obama formally brought American combat operations in Iraq to an end on 31 August 2010, more than seven years after the war began, he stated that it was time to ‘turn the page’. Obama’s choice of idiom – his instruction to ‘turn the page’ – frames this military campaign as though it were textual phenomenon; a chapter of conflict from which it was necessary to move on. It is a fitting idiom for a military campaign that has generated a proliferation of literary texts. The ‘Iraq War’ provoked a new tide of English-language war fiction, the pages of which depict the practical realities of military operations in Iraq, the resulting physical suffering and the emotional experiences of those involved in the campaign. Many of these literary accounts were produced by British and American soldiers who served in Iraq. The narratives are often based on soldiers’ own experiences, claiming a form of biographical legitimacy: they witnessed the conflict and are thus in a unique position from which to narrate it. Soldiers-turned-authors such as Iraq war veteran Kevin Powers (The Yellow Birds, 2012) and former US marine Phil Klay (Redeployment, 2014) have gained popular and literary acclaim for their depiction of the conflict in Iraq. They have been praised for their realist depiction of the physical brutality inherent in the structures of modern warfare and their poignant insights into the psychological impact this can have on the individual soldier. Powers’ and Klay’s texts are indicative of a much larger body of English-language literature composed by coalition soldiers that depicts the, often traumatic, experiences of those stationed in Iraq. Other examples include; My War: Killing Time in Iraq (2005), Fire and Forget: Short Stories from the Long War (2013) and Five and Twenty-Fives (2014). One reason for the proliferation of such texts is the various initiatives established to encourage war veterans who served in Iraq to write about their traumatic experiences as a form of arts therapy. For example, ‘Operation Homecoming’ was a project supported by the US Armed Forces, The Department of Defense, The National Endowment for the Arts, Random House Books and the Boeing Corporation that offered veterans the opportunity to attend writing workshops under the guidance of professional authors. The writing produced by the veterans was then published in the anthology, Operation Homecoming: Iraq, Afghanistan, And the Home Front, in the Words of U.S. Troops and their Families (2006). Such initiatives provide a valuable means of addressing conditions such as PTSD and offer readers important insights into post-2003 Iraq. Where are the words of Iraqi civilians affected by this conflict? There exists a growing corpus of recent fiction by authors of Iraqi origin on the years since the conflict, some of whom remained in Iraq and some of whom left. In particular, it engages with representations of Iraqi civilians’ ruined bodies in these texts. Reading a selection of literature that confronts readers with morbid depictions of civilians’ damaged corporealities, it positions the body at the centre of literary and political engagements with the conflict in Iraq. These novels respond to ongoing debates surrounding contentious counts of civilian casualties incurred in Iraq since 2003, as well as discussions of a violent bodily iconography that accompanied the military intervention in the form of graphic photographs and video footage. This literature appears to represent the damaged bodies of Iraqi civilians as metonymic manifestations of tensions that – as demonstrated by the Chilcot Inquiry – remain relevant to discussions of the ‘Iraq War’ today. How can the bodies of those Iraqi civilians killed since 2003 be adequately, or appropriately, represented? Through numbers? Through images? Through graphic literary texts? How do writers who removed their own bodies from the locality of Iraq write about those who died in their homeland? Does the process of writing about their bodies offer a form of literary, even temporarily physical, embodiment of those they left behind? How do these texts participate in a historical culture of commemoration that has necessarily developed in a country devastated by a series of political conflicts? This graphic passage confronts readers with an array of damaged bodies, urging them to recognise the humanitarian consequences for civilians of the violence that has dominated Iraq in recent years. In acts of writing similar to that of Jawad, the tales composed by Blasim and Antoon represent texts ‘for the faces of the dead’. They appear to honour the civilian casualties incurred in Iraq. Literary accounts by Luay Hamza Abbas, Ali Badr and Amal al-Jabouri have also been translated into English. Many of their texts also display a preoccupation with the human body; if you turn, for example, to the contents page of Abbas’s collection of stories entitled Closing His Eyes (2013) you are met with titles such as A Blood Drop to Discover the Body, Face Washing and The Eyes of the Metro Man. However, high-profile texts by authors of Iraqi origin remain relatively few and far between in the West as well as in much of the Arab World when compared with other focal points of Arabic literary culture such as Egypt or the Palestinian Diaspora. As Iraq remains relatively inaccessible and the bombing of al-Mutannabi Street in 2007 devastated the epicentre of its historic bookselling culture, nearby Amman seemed a good alternative in which to gather texts by Iraqi authors. I was therefore surprised to find very few of these texts in the various booksellers scattered across the city. After trawling through several bookstalls downtown, including the famous one on the corner just near the sweet-shop Habibeh, as well as most established bookshops in the city, the one contemporary text I found by an Iraqi author was Frankishtayn fi Baghdad (Frankenstein in Baghdad, 2013) by Ahmed Sa’adawi. Each bookseller had this novel displayed prominently, but not one had the texts by other Iraqi authors I enquired about. Frankishtayn fi Baghdad has gained considerable literary and popular attention in the Arab World. In 2014 Sa’adawi became the first Iraqi author to win the International Prize for Arabic Fiction (IPAF) for his novel centred on a monstrous character built out of the remains of Iraqi victims, referred to as the ‘shisma’, which might be translated into English as ‘what’s-it’s-name’. This bizarre, surreal, and in many ways grotesque novel delineates the ruined bodies that littered the streets of Baghdad post-2003. In an attempt to avenge the deaths of these victims, the ‘shisma‘ collects their remains and sets out to kill those who he judges to be responsible. What follows is a degeneration of social justice and a fragmentation of moral identities that reflects the physical disintegration described so vividly throughout the novel. 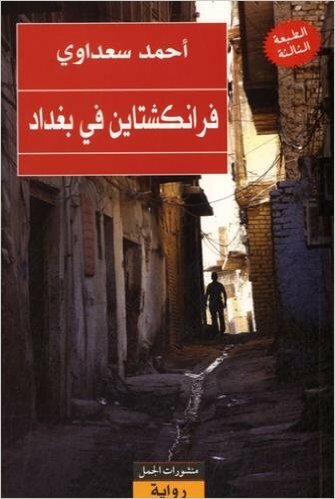 While the omnipresence of Frankishtayn fi Baghdad testifies to the widespread popularity of Sa’adawi’s novel, when it is displayed as the sole representative of Iraq’s contemporary literary culture, it also reinforces an old adage about Arabic literary culture: ‘Egypt writes, Lebanon publishes, Iraq reads’. This saying, I would argue unfairly, positions Iraqis as recipients of others’ words – receiving the narratives of others rather than constructing their own. This still oft-recycled adage does not acknowledge writers such as Jamal Hussein Ali, Dunya Mikhail, Burhan Shawi and Warid Badr al-Salim who have recently presented insightful reflections on the social, political, humanitarian and cultural ramifications of the coalition invasion and occupation of Iraq. The words of Iraqi authors may not be well-circulated but an alternative literary canon to the one propagated by British and American coalition soldiers exists. I eventually managed to get my hands on several of these texts through a large order from the online bookseller Jamalon. While I accept that, in line with the old adage, many of these texts had been published in Lebanon, they also demonstrate that Iraq’s literary culture is not solely based on reading, nor on bookselling, but also on writing. Hassan Blasim, ‘The Corpse Exhibition’, The Madman of Freedom Square, trans. Jonathan Wright (Manchester: Comma Press, 2009), 45-50, 46. Note the English title for this novel is not a direct translation from the Arabic title, which might be translated as: The Pomegranate Tree Alone. Sinan Antoon, The Corpse Washer, trans. Sinan Antoon (New Haven: Yale University Press, 2013), 131. Annie Webster started her PhD at SOAS in September 2016. Her doctoral research traces the evolving corpus of Iraqi literature that challenges dominant modes of understanding and textual engagements with recent conflict in Iraq.